Bharwan Karela | Stuffed Bitter Gourd Recipes : Bharwan karela (stuffed bitter melon) is a traditional Punjabi dish. Karela is also known as bitter melon and well known in nothern parts of India. It is a side dish and rich in nutrition. Because of its bitter taste, many people don’t like it especially kids. But I will tell you how to reduce its bitterness and make yummy nutritious dish for kids and adults as well. So let’s start…. 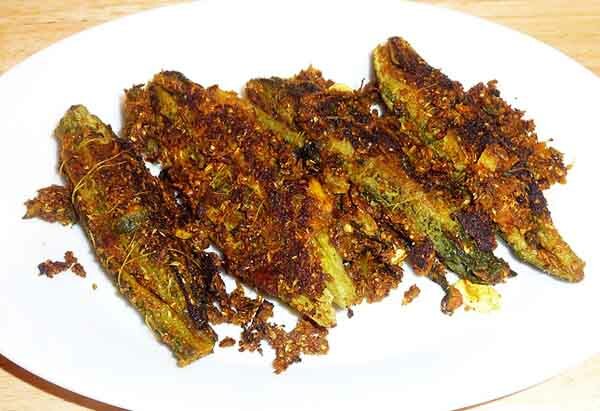 HOW TO MAKE Bharwan Karela? Rinse karela and wipe them dry. Scrap them and slit each karela one by one. Make it hollow form inside and remove all the seeds carefully. In a bowl add 1/2 tsp salt and 1/2 tsp turmeric powder and mix it. Apply it on the karela’s inside and outside. Keep it aside for for 2 hours. It reduces the bitterness of karela. After 2 hours, wash karela in running water thoroughly to remove the salt as much as possible and wipe them dry. Chop onions finely into dices. Now start filling the stuffing in karelas. Tie the karela with a thread. Add stuffed karelas to it and simmer it for 15-20 minutes on medium flame until the onion turns crisp. When karelas get tender, sprinkle 1/2 tsp of dry mango powder/ amchur on it. Preparation: Take 1 kg fresh karelas (bitter melon) of equal size. Wash them and scrap the karela’s (bitter melon) skin off. Rinse it again and wipe dry with a cloth. Slit each karela (bitter melon) one by one. Make it hollow form inside and remove all the seeds carefully. In a bowl add 1/2 tsp salt and 1/2 tsp turmeric powder and mix it. Apply it on the karela’s (bitter melon) by rubbing it inside and outside. Keep it aside for 2 hours as it will help in reducing the bitterness of karela (bitter melon). Later, squeeze the karelas (bitter melon) as much as possible and wash in running water thoroughly to remove salt. Wipe them dry. Prepare The Stuffing: Take a plate and add 1 tsp of salt, 1 tsp of red chili powder, 2 tsp of coriander powder, 1/2 tsp of turmeric powder and 1 tsp of fennel seeds to it. Mix it well so that each and every ingredient get mix evenly. Add finely chopped onions to it. Mix it. You can also roast the mixture if you want. For that take a pan add 1 tbsp oil to it. Add cumin seeds, asafoetida and fennel seeds and allow them to sizzle. Add finely chopped onions and sauté for 4-5 minutes. Turn off the flame and let it cool. Fill The Stuffing in Karela (Bitter Melon): Now our mixture is ready. Fill the mixture into hollowed karela (bitter melon) one by one gently. Now cut threads measuring 5-6 inches and tie around the karela (bitter melon) as masala will come out while frying them. Keep it aside until required. Cook the Karelas (Bitter Melon): Take a pan and add 2 tbsp oil/clarified butter to it. Heat it and add 1 tsp of cumin seeds, 1 tsp of fennel seeds (saunf) and 1/4 tsp asafoetida (hing) and let them sizzle. Add stuffed karela (bitter melon) to the pan and simmer it for 15-20 minutes on medium flame until onions turns crispy. Add leftover mixture to the pan and add finely chopped coriander leaves. You can also make stuffed karela (bitter melon) in microwave if you are health conscious. When it cooked from one side, toss it and cook it from another side. Add 1/2 cup of water if needed. When karela (bitter melon) get tender, sprinkle 1/2 tsp of dry mango powder/ amchur on it. Take (Dried Kasoori Methi) fenugreek leaves and rub it on hand and spread it on the karelas (bitter melon). Mix it well and simmer it for 4-5 minutes. When it cooked from all the side take out the stuffed karelas (bitter melon) from the pan. Switch off the flame. Remove the thread while serving. Stored Upto: After Cooling, you can store remaining stuffed karelas (bitter melon) in refrigerator and eat whenever you want, upto 10-15 days. Enjoy this Indian Classic Bharwan dish – Bharwan Karela (stuffed bitter melon). Check for more Bharwa Recipes – Bharwa lauki, bharwa tamatar, bharwa baingan.